There are many reasons for a fitness enthusiast to select Fitbit Blaze. The reasons will be discussed in the article. Apart from features, people also want to know how to charge Fitbit Blaze as the battery life, charging time, and way of charging matters a lot. How To Charge Fitbit Blaze? What Fitbit Blaze Has In Store? The first thing you need to do in order to charge the fitness tracker is to remove the tracker from the wristband. You just need to push the tracker out of the back frame and do it gently. Once you take out the tracker, the next step is to plug in the charging cable into the USB port of your computer. Now put your fitness tracker inside the charging cradle in such a way that the screen of the tracker facing towards you. Make sure the four gold prongs are aligned. Once done, close the frame. You will see a battery icon that indicates that the charging has started. The Fitbit Blaze takes 2 hours to charge fully, so you need to wait only for 2 hours. When the tracker is charged, you need to place it back. For this, you need to open the cradle and remove the tracker. Place it to the right position and wear it back to keep using the features. As we have discussed, the Fitbit Blaze takes 2 hours to charge fully, it is also important to know how long does the battery last. The battery life of Fitbit Blaze is 5 days, so with a 2-hour charge, you can use the watch for 5 days. It is also a fact that battery life depends on the use. For instance, Blaze has a connected GPS, so if you keep it connected all the time, then the battery may end up a bit early. If you use the usual features that it has such as tracking heart rate and all day activities, then it tends to last as long as 5 days. There are many people who are more towards fitness and still do not know why they need to use a fitness tracker. The main purpose of using a fitness tracker or you can also say a heart rate tracker is to keep a tab on all your activities so that you know how you are progressing and moving forward to reach your goal. Let’s have a bit of information about what Fitbit Blaze has in store. The first thing being a heart rate tracking it does is to keep a continuous tab on your heart rate. It has PurePulse technology that monitors your heart rate keeping a track on your pulse rate. With a constant tab on your heart rate, the Fitbit Blaze tells you about the intensity you need for the workout. Moreover, with the help of Fitbit Blaze, you can also keep a tab on your all-day activities such as steps taken, calories burned, distance covered, floors climbed, and active minutes. It also keeps a tab on your sleep stages and how well you sleep each night. The Blaze tracks how much time you spent in REM, deep, and light sleep. It improves the quality of your sleep and when you wake up, you can check the sleep status on your watch. The Fitbit Blaze displays accurate heart rate and other activities you do. So, you know what you are doing and what impact it has on your body, which is definitely a good thing because when you are moving towards a healthy life, you need every minute detail. This feature is really helpful as when you are doing any exercise, you need to know the correct posture to make it effective and if you do it the wrong way, it will never benefit you. With Fitbit Blaze, you can simply perform each exercise quite easily as it provides an on-screen workout coaching. It’s like your trainer is always with you to correct your moves. The SmartTrack technology has the ability to detect most of the exercises automatically such as running, walking, workouts, riding, cross-training, cardio, etc. So, even if you forget to log in the workout, it automatically detects it. In this article, we have discussed the prominent features of Fitbit Blaze and how to charge Fitbit Blaze. Being an accurate fitness tracker, Fitbit Blaze provides all the features that you may be looking to have in your heart rate tracker. Plus, it has a good battery life that lasts 5 days with a charge of 2 hours. To charge Fitbit Blaze is too simple and everyone can charge it. 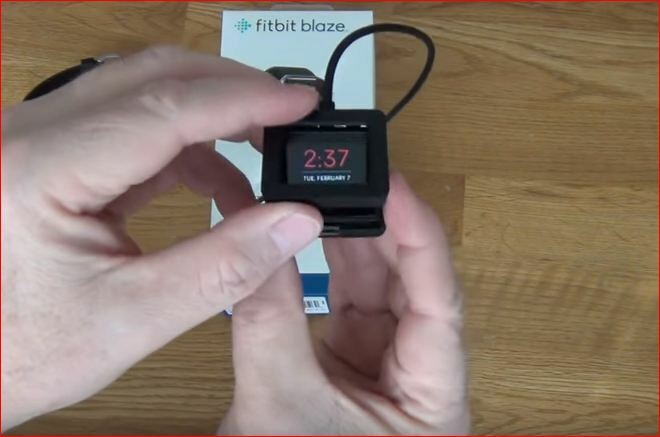 The above-mentioned procedure depicts how to charge Fitbit Blaze.